Fancy yourself as a bit of a genius? Show off your general knowledge skills with Fremantle’s Trivial Pursuit slot machine where you’ll be walking away with hard cash rather than paper money! The idea behind the Trivial Pursuit board game was generated in 1979 by Chris Haney and Scott Abbott, and through help from John Haney and Ed Werner was eventually released in 1982 – proving to be extremely popular bringing families together for entertainment. The purpose is to navigate around the board by correctly answering questions which are split into six different categories that have a different colour associated to uniquely identify them; and these are Sports & Leisure (which is a personal favourite of mine), Geography, Entertainment, History, Arts & Literature, and Science & Nature. Once a player has correctly answered a question from every category to fill their playing piece they then must answer a question from a category selected by another player – with a correct answer seeing them claim victory and an incorrect answer seeing them have to attempt again on their next go. Played across a 6x3 grid, rather than the usual 5 reels we are used to, with 15 paylines it boasts Wild Questions, a Correct Answer bonus, jackpots and even more – who knew answering questions could be so fun, and rewarding! 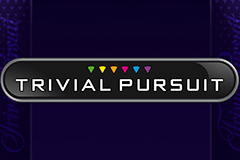 All of the symbols that feature in Trivial Pursuit have a crisp and colourful design with the main one being the Wild. This is represented by a question marks and has typical Wild rules with the ability to substitute for all the special symbols – of which there are a few. There is a pattern symbol, the Roll again symbol and Bonus symbols – yes, that means the Trivial Pursuit slot machine is packed with features. Sadly, those dreaded playing card symbols that we would rather just see in real money table games appear too with Ace, King, Queen and Jack featuring. I love this feature, and if you’ve ever played the Trivial Pursuit board game you will too. You are tasked with collecting the six different coloured wedges that represent the six different question categories, with the wedge at the top left of the screen filling up as each wedge is added. Once all six of these wedges have been accumulated (which does take quite a few spins from my experience, but proves very worthwhile) it’s time to play the Bonus Meter feature which sees you take to the hot spot where you face six questions and must choose the correct answer in order to win bonus points. After all of the six questions have been asked and answered your bonus points are then converted to cash and added to your balance – I’ve not had a Sports & Leisure question wrong yet! With the gamble option activated and a win including the Wild and Pattern symbols you’ll be whisked off to a new screen where a character is preparing to answer a question. While you’d assume the character represents you, they actually don’t. Instead you must bet on whether they will answer the question that they are asked correctly or incorrectly. If you decide right you’ll win cash and have the opportunity to double up with another question, but a wrong decision sees the feature end! It’s a little disappointing that there isn’t a free spins mode offering a set number of spins but each and every time you land the Roll Again symbol on the reels you’ll be rewarded with a free re-spin – and it can be retriggered, so if another lands on that spin the reels will just keep on spinning! I was pleasantly surprised by the variety of bonus features that Fremantle have been able to incorporate into the Trivial Pursuit slot machine – heck there are also four jackpots which weren’t mentioned above that can be randomly won with the Mini, Minor, Major, and Super – each of which gets progressively larger. Personally I prefer the Monopoly Big Event slot machine which was developed by Barcrest as I prefer Monopoly and found it to offer even greater wins, but Trivial Pursuit is certainly amongst the best board game slot machines around!